I am a Trekkie. I admit it. And I came about it honestly. My father was one of the original Trekkies and he instilled a deep love of all things Star Trek in his children at an early age. One of the ways I like to unwind at the end of a long day is to simply watch an episode or two of the original Star Trek series. I’ve seen every episode dozens of times each and I have not yet grown tired of a single one of them. I noticed something that I have long found amusing about the crew of the USS Enterprise. 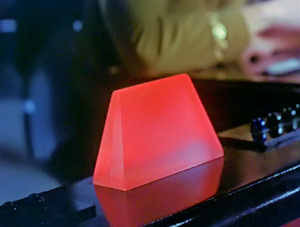 Captain Kirk orders the ship to go to red alert as they prepare for a collision with an unknown entity and the scene suddenly cuts away to the corridors. Men and women in their neat color-coded uniforms walk purposefully, but without hurry, as the alarm system buzzes loudly and red lights flash on and off. I’ve always snickered at the crew’s seeming lack of concern–even as the cameras zoom in and out rapidly on the flashing lights to highlight the intensity of the moment. These unhurried men and women are supposedly the finest of Star Fleet. They have been entrusted to serve not only on a starship (the cream of the crop), but on the Enterprise. This is the king of all starships–the very best of the very best. This amazing, unparalleled starship is under attack… but the finest in Star Fleet are just strolling along through the corridors, as though there is no hurry. Shouldn’t they be at least a little concerned? And then it struck me: Of course they are calm! They are the best of the best. These are the people who shot to the top of their class at Star Fleet. They have been trained. They have dedicated themselves to knowing their jobs better than anyone else could. They could do what they do blindfolded and still do it better than other people. Panic would indicate insecurity–a fear that they would not be able to accomplish the very thing for which they have trained and prepared. Panic would undo their training, cloud their judgement, and distract them from the task at hand. Panic would prevent them from being what they are: the best of the best. Isn’t this what we are asked to do by Jesus Christ when we are called to be disciples? To study, to prepare, to condition our souls, our hearts, and our minds to be more like him? Jesus was thirty when he went out into the desert and spent forty days being tempted by the devil–we know very little of what he was doing in those first thirty years. But we get a hint when we see him at work in the wilderness: Jesus is ready for whatever the devil is going to throw at him. What is unwritten is very clear. Jesus has been preparing. He’s been studying scripture. He’s been praying. He’s been in constant contact with God. He’s built himself up and conditioned himself to be ready to face the worst that is to come. In the good times, when our lives are calm and things seem to be going exactly the way we want it to go, we have a job to do. We need to be focusing our attention on being prepared. We need to be conditioning our souls, our hearts, and our minds. We should be doing all the things we must so that we can look and think and act more and more like Jesus with each passing moment. That way, when the red alerts in our lives go off, we are ready. We won’t flop around in a panic, rushing to and fro and making a bigger mess of things. We will be ready. Like the crew of the Enterprise, we will walk with purpose straight toward our goal, but we won’t be distracted by fear and our mission will not be jeopardized by our confusion. So get ready! If today is calm, enjoy it and treasure it… but don’t waste it. Use it. And use it wisely… because tomorrow might be a red alert kind of day, and it will be too late then to get ready.